Of late, I've been watching my box set of the original "Twilight Zone." I had already watched all of season 1 so began at season 2 and now am watching season 3. Since Matheson wrote several episodes for the series, I decided to post a couple of rare mystery paperbacks he wrote in the 1950's. These books were released in paperback form for the first time, making them paperback first editions, or PBOs (paperback originals). 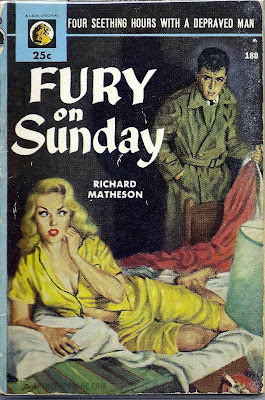 Matheson didn't write many mysteries and since these are first editions, they are sought after by paperback collectors and Matheson fans alike. I love the tagline "Men--they're all pigs!". 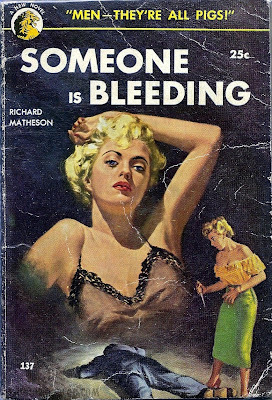 That's just pure pulp.